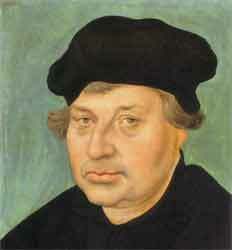 Johannes Bugenhagen (1485-1558), was from Pomerania in northern Germany. Because of his ancestral region, he took the Latin name Pomeranus and Martin Luther often called him "Doctor Pommer." He was appointed pastor of Wittenberg in 1523 through the efforts of Luther and thus served as the reformer's pastor and confessor. One of the greatest scholars of the Reformation era, he helped translate the New Testament into Low German and wrote a commentary on the Psalms. He also worked to organize the Lutheran Church in northern Germany and Denmark, journeying to Copenhagen where he crowned both King and Queen and consecrated seven men to the offices of superintendent and bishop. For those who think that their pastors preach too long, you share that complaint with Luther, who described Pomeranus' preaching as "whatever comes to mind, much like a maidservant chatting with another at the market." One story says that Luther recommended Bugenhagen cut his sermons in half and preach no more than an hour, lest all minds wander. More information is available through the Christian Cyclopedia and Wikipedia. O Lord God, heavenly Father, who called Johannes Bugenhagen as pastor and confessor of the Faith, grant us faithful pastors in our time; pour our Your Holy Spirit on Your faithful people, keep them steadfast in Your grace and truth, protect and comfort them in all temptation, defend them against all enemies of Your Word, and bestow on Christ's Church Militant Your saving peace; through Jesus Christ, Your Son, our Lord, who lives and reigns with You and the Holy Spirit, one God, now and forever. Drewe, even Luther's recommended one hour is too long for most people. The aardvark is a "down & dirty" critter that spends its life rooting yucky things out of their dark haunts and feasting on their carcasses. Nuff said? Ask not what blogging can do for you but what you can do for blogging.